Carla is a R.V.T. 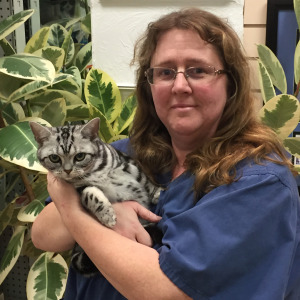 (Registered Veterinary Technician) and her years of experience make her a great asset. Carla’s charm and wit make her a delight to work with, and people and pets alike respond to her compassion and kindness. Carla shares her home with her husband Michael and her two fabulous felines, Lily (aka Sugarlips) and Tippy (aka Doodles). She enjoys the saltwater aquarium hobby and recently set up her new 55 gallon coral reef tank. Her favorite fish include a saltwater puffer (Tank), a yellow watchman goby (Les), and a dwarf lionfish (Leo). Carla also enjoys outdoor activities, especially fishing and camping. She also enjoys video games and reading.